Click on image to download a printable PDF. HomePorts Inc. and Kent County Public Schools, in partnership with the Kent County Health Department, the University of Maryland Shore Regional Health and Anne Arundel Medical Center, will hold the annual Health and Wellness Expo on Thursday, Oct. 18. The expo is from 8 a.m. to noon at Kent County High School in Worton. According to a news release, this year’s expo, which is free and open to the public, is the largest ever held in this area. The event will highlight more than 75 community resources offering the latest health, wellness and safety information. The release states, the expo is a one-stop opportunity for busy individuals and families of all ages. Features include free health screenings, free morning refreshments, flu shots, 12 talks by local medical professionals and lunch available for purchase. “Stress Management” — Patricia Deitz, licensed clinical social worker, Chester River Behavioral Health. The school gym will serve as a exhibit hall, with tables staffed by professionals offering a variety of information and guidance on local services. For information on exhibiting, contact Greer Davis, 410-708-2993 or ggbdavis@gmail.com. The deadline for exhibitor sign-up is Sept. 15. 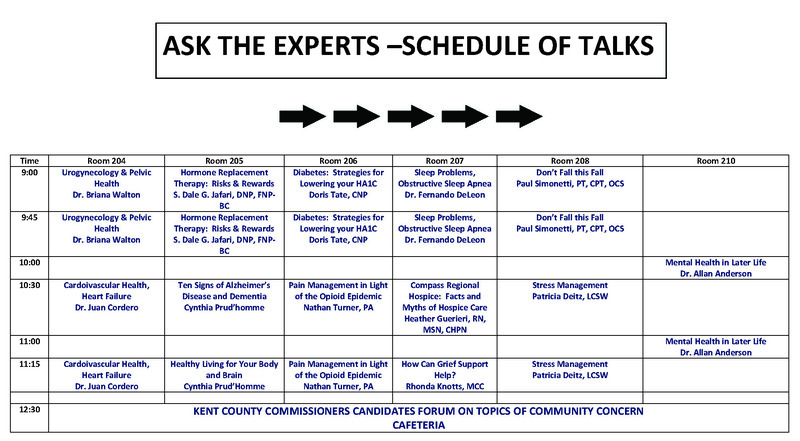 In addition, at 12:30 p.m. there will be a forum with candidates for Kent County Commissioner, who will address topics of community concern. For more information, email karen@homeports.org or visit homeports.org.